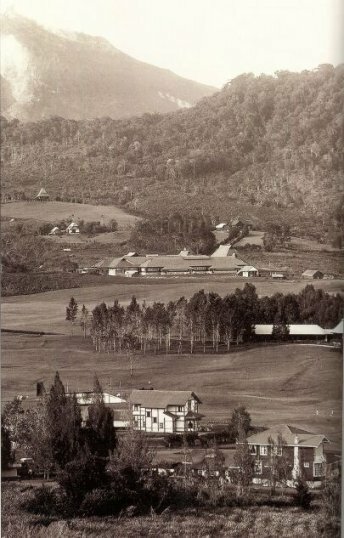 The boarding school of the Planters Vereeniging (Planters Association) in Brastagi, around 65 kilometers from Medan, was used as a prison camp from mid-April 1942 for more than three years. At first the camp was for men, women and children, later only a women were housed here. The boys from this camp were taken in May 1943 to Soengeisenkol and later to Sirengorengo. The women and children finally were moved to Aek Pamienke III. After June 1944 the food supply deteriorated rapidly, and nearly 400 women escaped in an effort to exchange clothes for food in the surrounding villages. They were all caught after a few hours, after which the camp and block leaders were tortured by the Kempetai and then imprisoned in Kabandjahe. In July 1945 all internees were transported to Aek Pamienke. (Dulm 2000: 44).